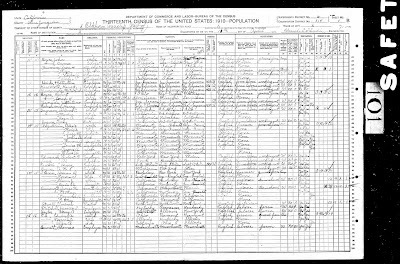 Since I covered my great-grandparents in the 1920 census last week and the 1930 census the week before that, this entry covers them in 1910. 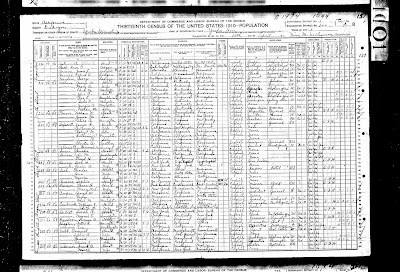 My great-grandfather (Joseph J. Allen) was living at 817 Engelman St. in Manistee, Manistee, Michigan with his family. 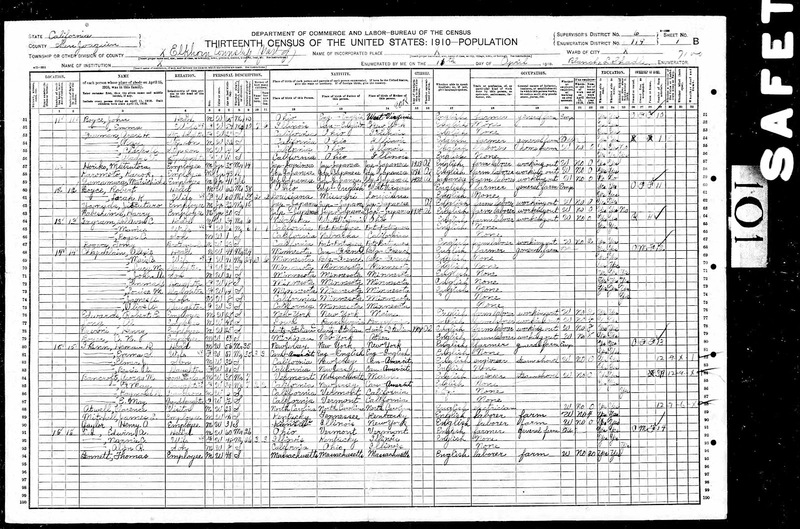 1910 US Census, Manistee County, Michigan, population schedule, Manistee Ward 4, enumeration district (ED) 0038, p. 2A, dwelling 24, family 30, Joseph J. Allen (son); digital images, Ancestry.com (ancestry.com : accessed 11 June 2011); NARA microfilms publication T624, roll 661. My great-grandmother (Daisy M. Croad) was living with her family in Millbrook, Mecosta, Michigan on their farm. 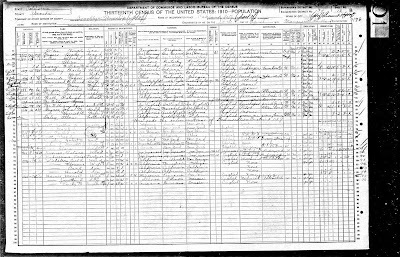 Daisy's parents had immigrated to the US in 1892 and had become naturalized by 1910. 1910 US Census, Mecosta County, Michigan, population schedule, Millbrook, enumeration district (ED) 0130, p. 13A, dwelling 3, family 3, Daisy M. Croad (daughter); digital images, Ancestry.com (ancestry.com : accessed 13 June 2011); NARA microfilms publication T624, roll 663. My great-grandfather (Elmer J. Shinn) was living on the family farm in rural San Joaquin Co. (enumerated as Elkhorn Twp.). 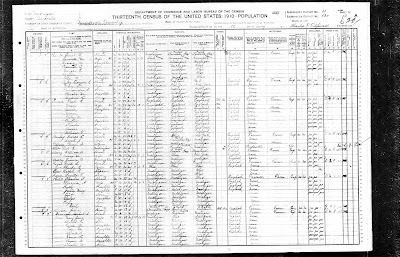 1910 US Census, San Joaquin County, California, population schedule, Elkhorn, enumeration district (ED) 0119, p. 1B, dwelling 15, family 15, Elmer J. Shinn (son); digital images, Ancestry.com (ancestry.com : accessed 20 June 2011); NARA microfilms publications T624, roll 103. 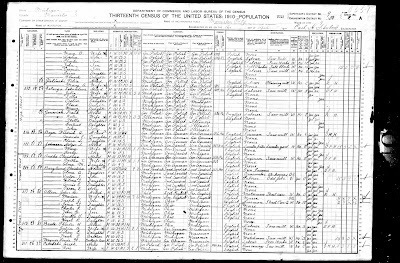 1910 US Census, San Francisco County, California, population schedule, San Francisco Assembly District 35, enumeration district (ED) 0119, p. 5B, dwelling 81, family 87, Gladys V. Healey (daughter); digital images, Ancestry.com (ancestry.com : accessed 20 June 2011); NARA microfilm publications T624, roll 98. 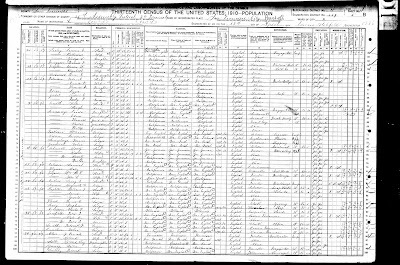 My great-grandfather (Gideon G. Berger) was living with his family but for whatever reason was enumerated on a different page. The Bergers were living at 388 Twentieth St., Oakland, Alameda, California. 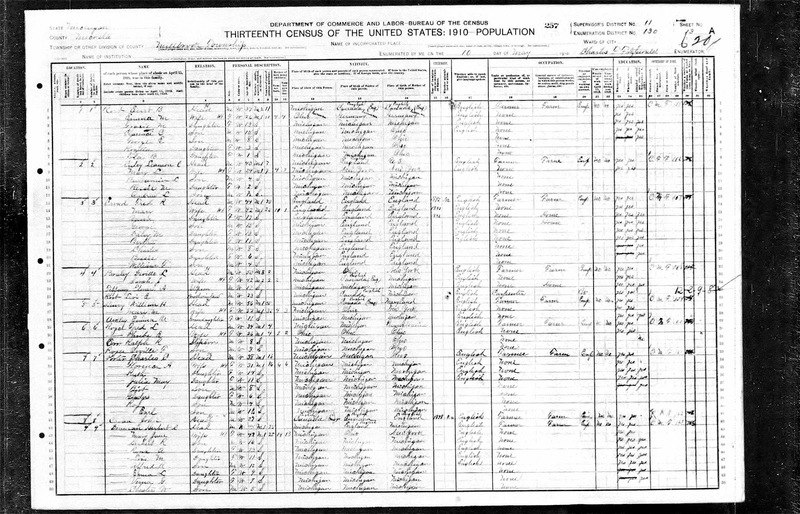 1910 US Census, Alameda County, California, population schedule, Oakland Ward 7, enumeration district (ED) 0139, p. 12B, dwelling 57, family 61, Gideon Berger (son); digital images, Ancestry.com (ancestry.com : accessed 20 June 2011); NARA microfilm publications T624, roll 71. 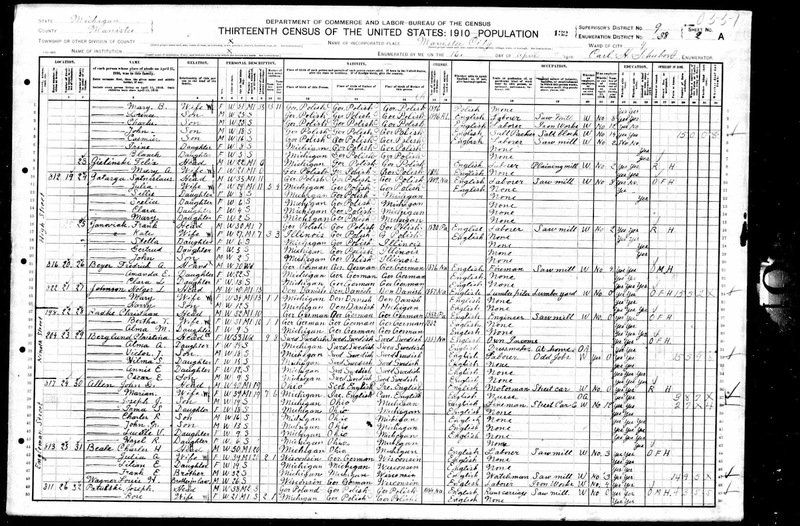 My great-grandmother (Georgiana "Georgia" Wellons) was living with her family at 218 North St., Yreka, Siskiyou, California. Interestingly, Georgia was given the middle initial 'A.' 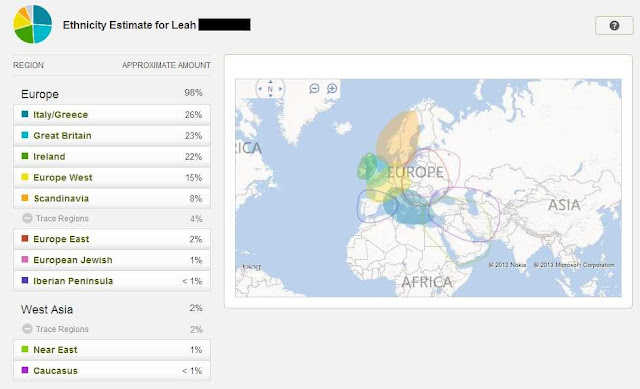 in this census. I think maybe they said 'Georgiana' but the enumerator heard 'Georgia A.' or thought her name was "Georgia Anna' and abbreviated. In any case, this is the only instance where she is given a middle initial of any kind. 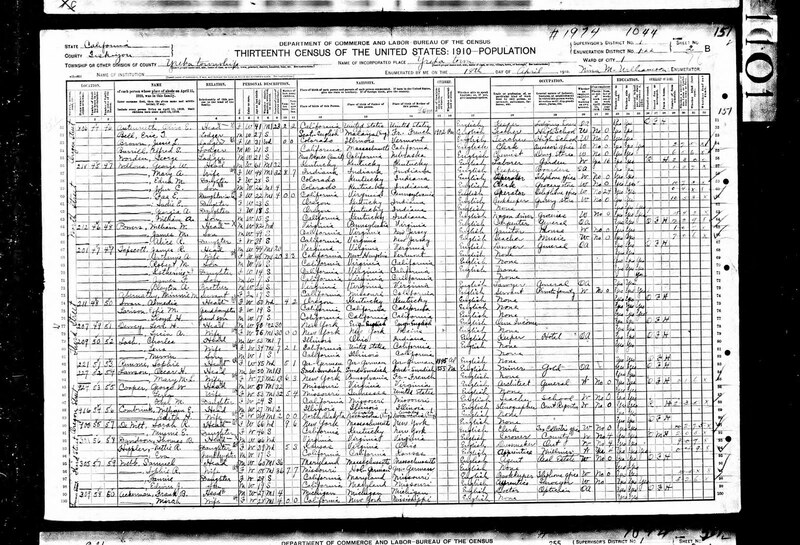 1910 US Census, Siskiyou County, California, population schedule, Yreka Ward 1, enumeration district (ED) 0121, p. 2B, dwelling 45, family 47, Georgia A. Wellons (daughter); digital images, Ancestry.com (ancestry.com : accessed 20 June 2011); NARA microfilm publications T624, roll 108. 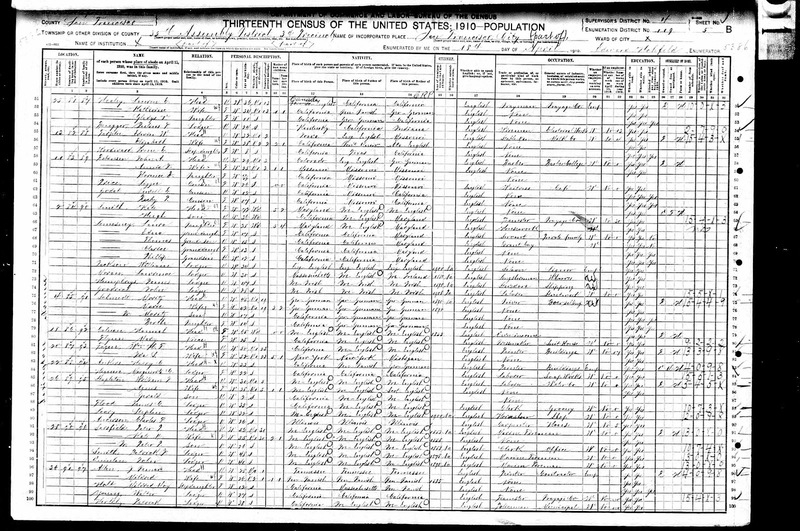 The only greats who weren't enumerated in this census were my paternal grandmother's parents who were still in Italy at the time.